Apparently assuming state-enabling legistation would be approved, staff was moving ahead with bike lane implementation. The DE May 23 photo shows Council members McChesney and Skinner exhibiting the newly created “Davis Bikeway” sign. I did not see any bike or bike lane related stories in the March or April issues of the DE. These topics do not return again until May, where activities of the California Legislature are reported. It is sometimes difficult to select “a” date as “the” time at which a practice or policy began. This is because some practices in fact go through several “critical junctures” each of which is arguably “the” “real” start. Such is the problem with the beginning of Davis bike lanes. Arguably, bike lanes in Davis “really” began in 1966 when the Council adopted a resolution directing staff to draw up a plan for bike lanes and allocating money for that task. But, the events reported in this post about the Council’s action on Monday, February 13, 1967 form another arguable “actual” start of bike lanes in Davis. As can be read in the two DE stories, a specific plan of action “on the ground” was authorized. Even so, nothing actually “on the ground” had yet happened. Moreover, it was not yet clear that the City of Davis has the legal right to install bike lanes on its streets. So, I am prepared to say that the process of having bike lanes has started, but they have not yet actually begun. 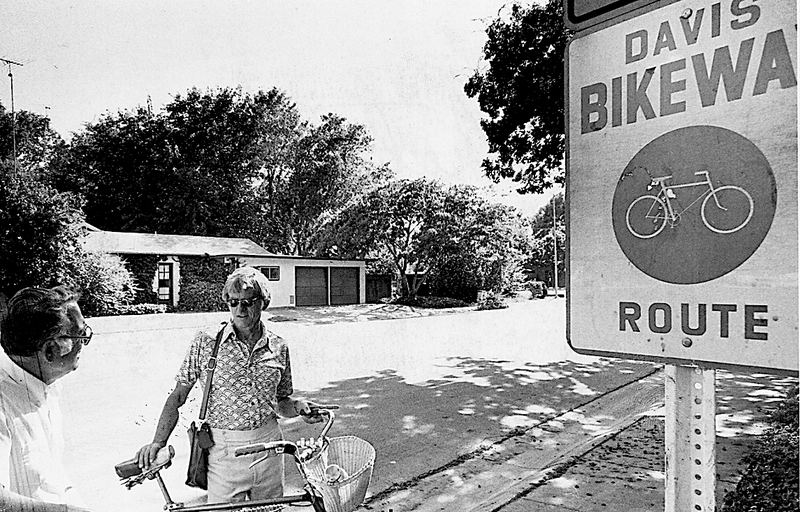 In 1966, the City Council directed staff to prepare a plan for a “pilot” program of bike lanes on Davis streets. This put the topic on the back burner while the plan was being prepared. That period did not end until the Council meeting of February 14, when the pilot project was presented and adopted. This did not of course stop discussion of the “bike problem.” One forum for such discussion was a wonderful “organization” that functioned over a number of years in the 1960s called “The Clamor Club.” Sponsored by the Chamber of Commerce, it was a weekly or so noontime gathering of anyone who cared to show up in the back room of Quessenbery’s Drug store. The official purpose of the gathering was to air “gripes!” Just show up and complain about whatever you please. 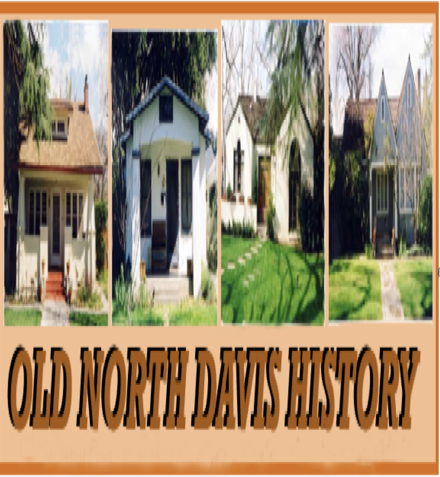 A THIRD CANDIDATE DESIGNATED HISTORICAL RESOURCE. 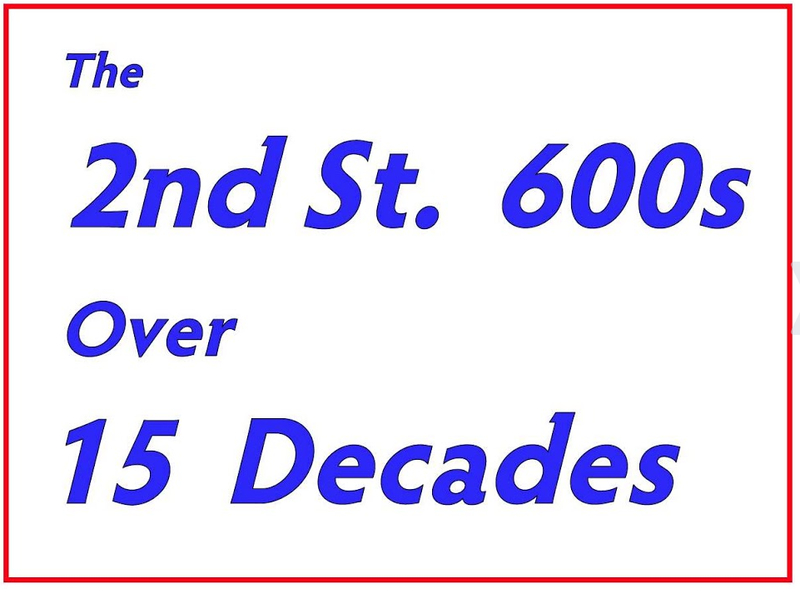 So far I have worked up some materials relevant to such designation decisions on 1303 Alice Street and on 340 F Street (the Wells Fargo Bank building) (DHT posts numbers 189, 186. 187, 188). 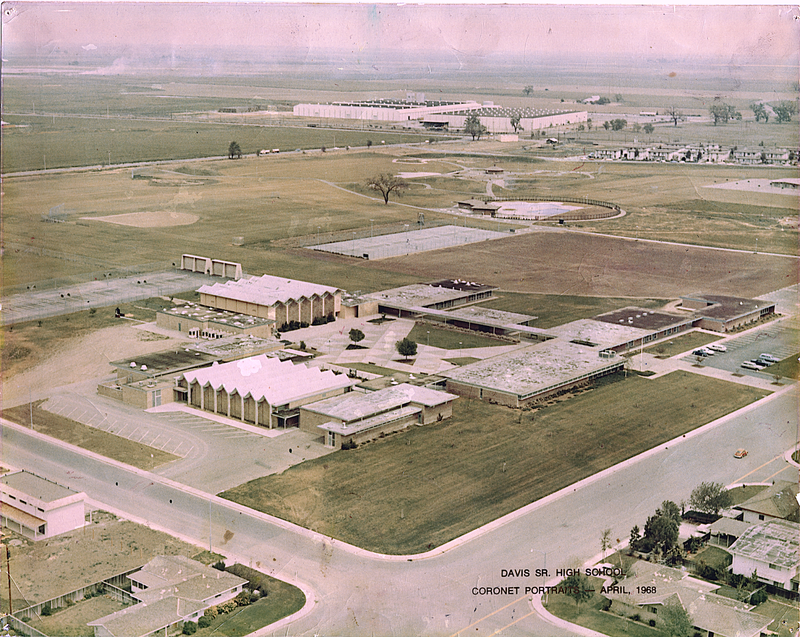 Many thanks to Linda York, Davis High School librarian, for bringing this photo to my attention in the holdings of the Davis Senior High School Library. longer the case. 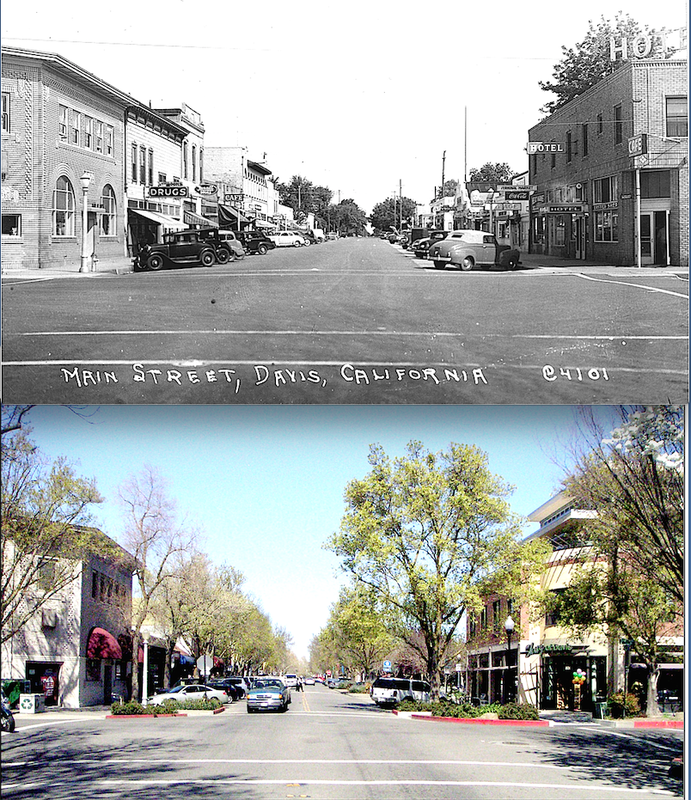 Even so, in 2008 (Davis’ 140th year), I thought it might be interesting to make “just one more” effort to capture that view. I reproduce it here along with an iconic 1945 shot (from a postcard) that presents G Street at its fullest development before post war decline. The two small side-by-side shots seen here are previews. For full size views, click “read more,” just below. The original of this 1991 cartoon graphic of Downtown area Davis merchants measures 18 by 24 inches, is printed on heavy gloss stock, and was presumably intended for posting or framing. The details of the image are too complex for easy viewing reproduced at a size to fit this website. Therefore, after the jump, I present it in four enlarged sections numbered 1 through 4. 1 is the upper left, 2 is the upper-right, 3 is the lower-left, and 4 is the lower-right. The Davis Blue Devil Senior High Band passes the UCD Picnic Day review stand on F between 3rd and 4th streets circa 1975. 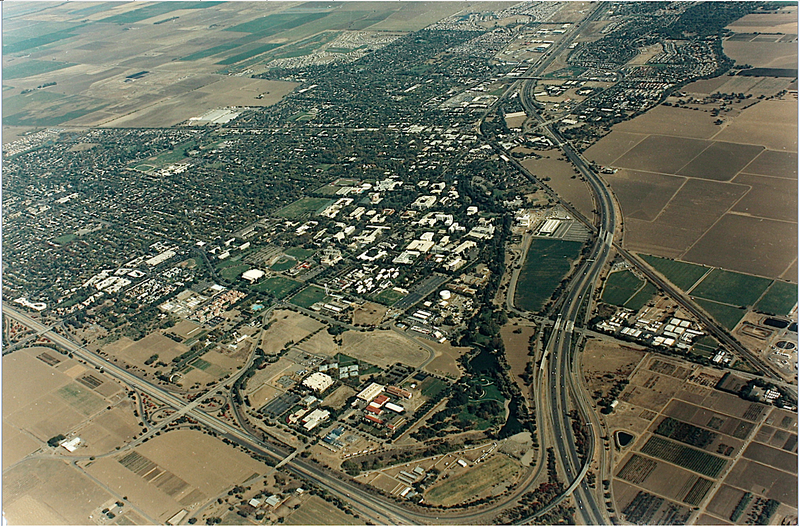 Davis is host to several regional and other running events a year. The “Turkey Trot,” held the Saturday before Thanksgiving, is among the more colorful and appears to attract “runners” for whom this is their first or at least an early effort. En masse, they seem less like trained athletes than lumbering couch potatoes. 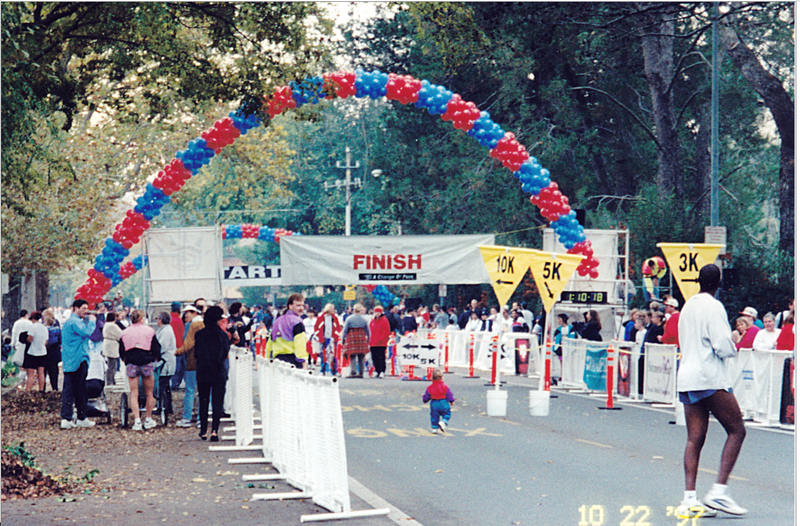 The photo here shows the finish line on B Street between 6th and 7th in 1997. 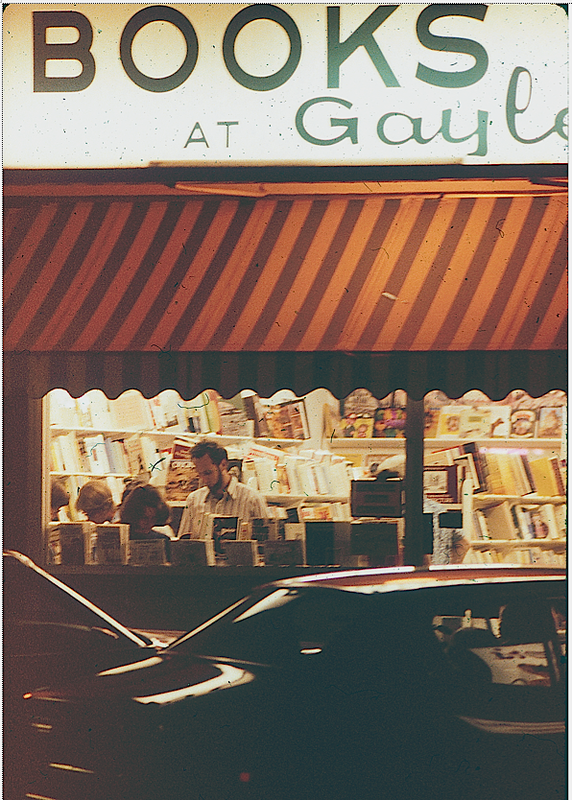 Over the ‘70s and ‘80s Books at Gayle’s was Davis’ main and sometimes only serious bookstore. The owner was particularly adept at carrying titles in a variety of fields likely to appeal to the city’s growing population of serious readers.